So many writers talk about how essential it is to have a critique group, and that’s true, but a book club is just as essential! It’s gotten me out of my reading comfort zone. For instance, I never would have read the commercial fiction “Coconut Cowboy” or the sci-fi classic “Do Androids Dream of Electric Sheep” without someone picking it. The best writers read widely, and knowing why some writers fail is just as important as knowing why other writers succeed. It’s helped me to discover the core pleasures of readers. For many years, when I only had my work read by writers, I was trained to seek after certain high literary pleasures, which can be inaccessible to many readers. But with my book club, it’s wonderful to get the insight of regular readers: they love big plots and deep characters and wild humor. 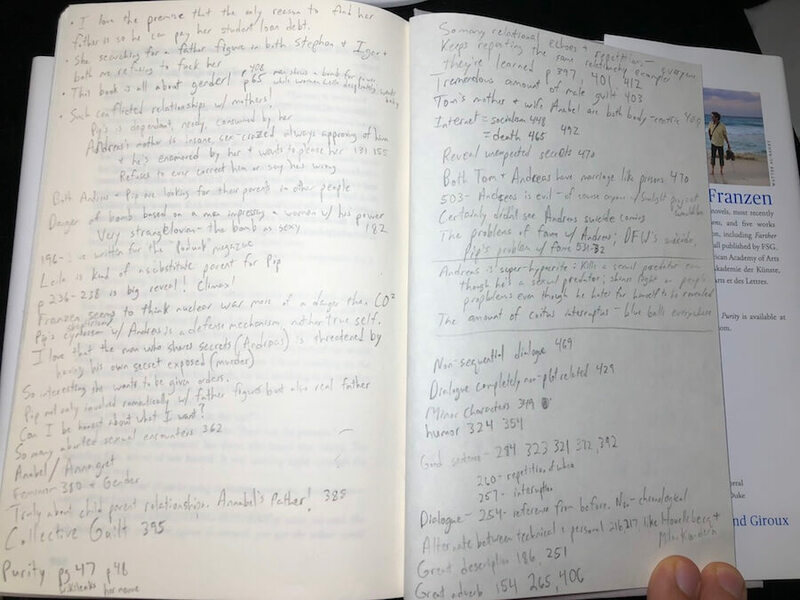 I’ve changed my writing because of how they read books. It’s provided a community to bounce ideas off. I can pitch them a story and see how they take it. I can see the way they talk about some books and get ideas for future books. They’re a sounding board for my literary ambitions. It inspires me. Nothing fires me up to write my book more than talking deeply and thoughtfully about another book for several hours. Every book club is like a pep talk session for writers. 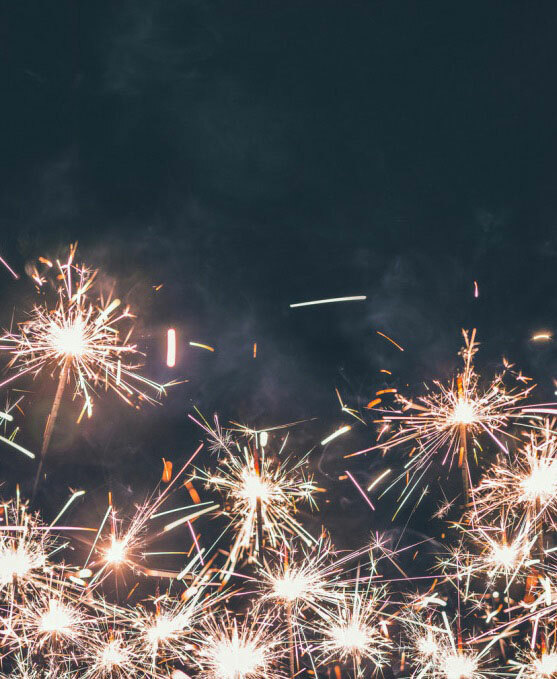 Read on to discover how we use Book Kings, avoid “Bookclub Killers,” and go on flights across the country to create a straight-up-awesome book club. Okay, if you haven’t yet started your book club yet, here’s some Beginner’s Advice (and if you’re an expert in book clubs, skip to the end to see some Advanced Advice). How often will you meet? Where? Let people know what they’re getting into. We came up with very strict rules at the beginning: we were only meeting at my house, every other month. Very consistent. Read only nonfiction or only fiction or only poetry. If you choose fiction, what type of fiction? Older books? Mystery or Literary? We tend to read modern classics and literary fiction written in the last 5 – 30 years. This is the most important element of each book club. We know one all-guy group that has competitions of brains or brawn every other month (Sprints! Puzzles! Trivia! ), and the winner of the competition gets to choose the book. We know a women’s book club that throws 50 – 70 books into the mix and they decide in a democratic way which 12 books most members want to read for the next year. For the Bookhouse Boys, every member gets a chance to play Book King and select a title. There is no veto power: whatever the Book King decides, it is decided. Every once in a while a Book King will be waffling between several options and share those options to get the group’s opinion, and that’s fine. What I love about our club is how everyone brings something to the table. We have the philosopher, the lawyer, the literary snob, the guy with the photographic memory of everything in the book, and the practical dude. Everyone has insights to contribute. I would recommend being very picky when you’re putting one together – most people aren’t a great fit for a book club. You don’t want people monopolizing the conversation or who are simply annoying. Pick people who bring some kind of knowledge to the table. Also, I would recommend you choose non-writers. Writers get a lot of feedback from fellow writers, while a book club should be a place where you can hear what readers are thinking. 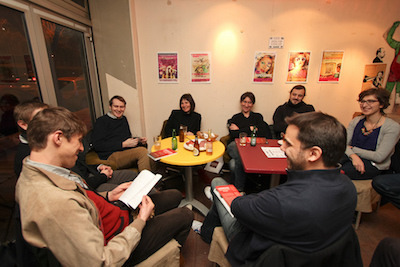 Book clubs don’t work when you have members wandering in and out of the club. We don’t invite strangers in and everyone makes it virtually every meeting. 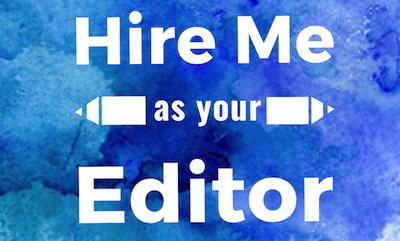 Don’t recruit half-interested members. We do the first Tuesday of the month, every other month. We stick to this schedule pretty rigorously. People should plan their schedule around our book club; our book club shouldn’t plan around members’ schedules. If it’s not a regular date, the emails back and forth (or Facebook group messages) get burdensome. Keep it regular. You think this doesn’t apply to you, but trust me, it’s essential. Nothing says “Bookclub killer” like a 700 page book. I would suggest keeping books under 300 pages. It’s okay to have a longer book every once in a while, but I strongly encourage shorter books. People can remember them better and they finish them more often. What’s more, because the reading doesn’t feel burdensome, they tend to like the group more. And if someone doesn’t like a book, they don’t have to keep slogging through the 500-page remainder. Of all the advice I’ve given you, this is probably the most important detail. Ignore it to your peril. A group without a name is a group that falls apart. Names bind the group together. Make it fun. Make it an inside joke. For instance, our name – Bookhouse Boys – comes from a Twin Peaks reference. Key idea: use this name every time you send an email/message. And don’t pick your name at the beginning. You can pick it about a year in, once you’ve figured out the identity of your group. In the Bookhouse Boys, you have to finish the book. We don’t allow any half-assed discussions where only one person in the group finished. That, in my honest literary opinion, is the worst book club I can imagine. Every once in a great while we’ll have a super-busy member who failed to finish the last few chapters, and they must confess this sin to the group and ask for permission to come. We forgive them, but the important thing is that they had to ask for permission to come. Also, that’s a rare event. Something I’ve always prided myself on is how we spend 2 – 3 hours talking exclusively about the book. We don’t get sidetracked. We don’t start talking politics (okay, occasionally on election years, but only before we start book discussion). But overall, we focus on the book alone. You can do this differently – maybe your group loves rabbit trails and your conversations are mind blowing. Wonderful. Do it. To me, though, that dilutes the power of a book club. 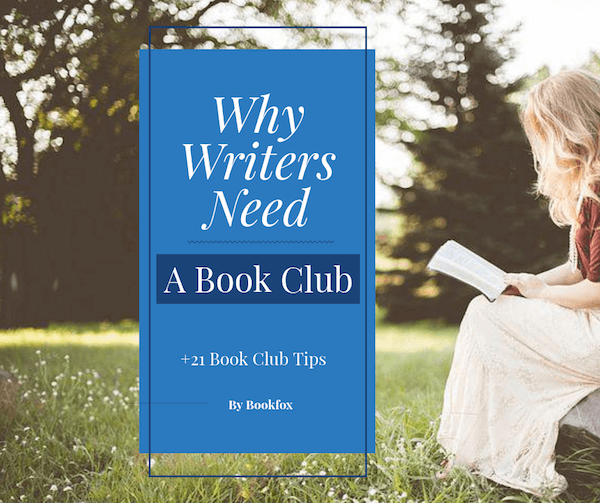 You have a book club because you enjoy talking about books, and book clubs are generally greater and more essential if they focus mainly on the book. I mean, no-brainer, right? We do a blind wine-tasting each book club. Someone brings a bottle with the label obscured, and we guess vintage, grape and region. You’d be surprised at how often we get pretty close. Also, we make sure to have snacky food and some hard liquor. And have we done themed food? Why yes, yes we have. For Cormac McCarthy’s “Blood Meridian,” we served hardscrabble man-food like nuts and salami. For John Steinback’s “Grapes of Wrath” we drank whiskey and wine, both prominently featured in the book. But we don’t always do themed snacks. Sometimes food doesn’t really appear in a book, and other times it’s just too persnickety. The point of a great book club is fantastic conversation, not a Pinterest-worthy meeting. Or, sometimes it’s fun to buck the trend and go against the book. Right now we’re reading “The Vegetarian” by Han Kang, and I’m definitely going to serve meat. Okay, enough with the beginner techniques. Now it’s on to the fun advanced techniques. Our best conversations have been focused on the book, but then there’s always that moment at the end where we relate the book to our own life, or talk about a theme brought up and how it affects us. For instance, at the end of Douglas Coupland’s “Generation X,” a character asks, “What’s the most valuable thing you own?” And it’s revealed that this person’s most valuable thing, which he keeps in a safe, is a paparazzi photo he took up Marilyn Monroe’s skirt. So what we did in our book club was to answer the question for ourselves. It’s a difficult question, but everyone’s answers were so revealing and profound (My answer was also a photograph: one I took of the twin towers as they fell – I was in the East Village at the time). If your book club doesn’t currently apply the book to everyone’s lives, I would highly recommend it. In short: get personal. Nothing is better than looking at a row of 20, 40, 80 book titles and realize you’re part of a group that has shared in these experiences. 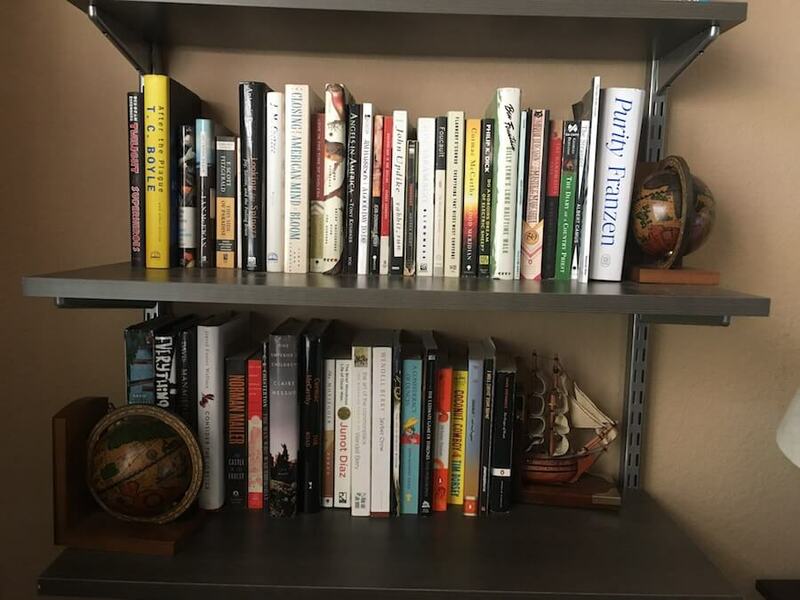 My friend Drew does this, and he sent me a photo of his bookshelf. If you have a meeting where you don’t compare the book in question to previous books you’ve read, you’re not doing it right. The main joy of a book club is that you’re creating a web of sharing reading experiences, and so as the book club progresses, you can start to arrange and compare books. When we read a book where they’ve made a movie, we’ll have an interim event where we’ll get together and watch the movie. For instance, we read Ben Fountain’s, “Billy Lynn’s Long Halftime Walk,” and a few months later we watched the Ang Lee movie of the same title. It’s always a great discussion about differences between the book and the movie (Ang Lee, how could you have left out the central, pivotal scene where the cheerleader humps Billy Lynn??? For shame!). It’s always fun to discuss exactly why or how the movie didn’t live up to the book, or how the experience was different. In fact, there’s a book club based entirely around this premise called “Pages, Pictures and Pints.” Every month they read the book, watch the movie based off the book, and meet for pints at a brewhouse. This is artwork I commissioned of The Judge for my Triangle Method of Character Creation course. This might be more of a personal thing, but I think it’s exciting to make a few wagers related to books. For instance, one of our members who had a popular podcast had full confidence that he was going to be able to interview Cormac McCarthy. I knew there was no way in hell the reclusive McCarthy was going to grant him an interview. I mean, Oprah barely got him. So we bet that if the book club member couldn’t get an interview, he would dance naked on a picnic table while playing a fiddle (this is a reference to The Judge in McCarthy’s “Blood Meridian.”). So far, he has not gotten the interview. Also, so far, he has not danced naked. But we’re still waiting. Once you’ve had the book club going for a while, consider this: what has been your best book? The best book is NOT the one that everyone liked. The best book is the one that everyone talked about for the longest. That info is very revealing. It tells you what type of books your group should be focusing on. I would recommend pointing this out to the group and trying to steering future book picks in this direction. For instance, our best book club book of all time was Claire Messud’s “The Emperor’s Children.” We talked for 5 hours straight about it – impassioned discussion, tearing apart the characters and reconstructing their lives and values. Debate was heated but cordial. The insights were profound. I walked away feeling like I’d had a spiritual experience. Why was that book so good? 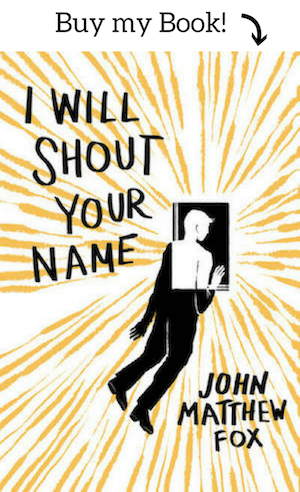 I think it’s because every single character felt like a real human being, but also every character was ambiguous – there were multiple ways to read him or her. It was 5 hours at an Italian restaurant in Pasadena that I’ll never forget. And what’s more, I now think of that book in particular when trying to select a book – I want to recreate that experience, because I know it fires up my group. The notes I take in the back of each book in pencil are essential. Not just notes as I read, but also all my fellow Bookhouse Boys’ observations. By the end of the night, I have a rich tapestry of ideas about the book, and I’ve totally referenced these when writing about the book later. Every once in a while, it’s awesome to have the book club at a house where you can spend the night. That means you may imbibe without restrictions, and everyone can stay a lot later. This really binds the community together. I would recommend breaking out a board game once the book conversation winds down (Settlers of Catan!). We have a once-a-year trip we do together. 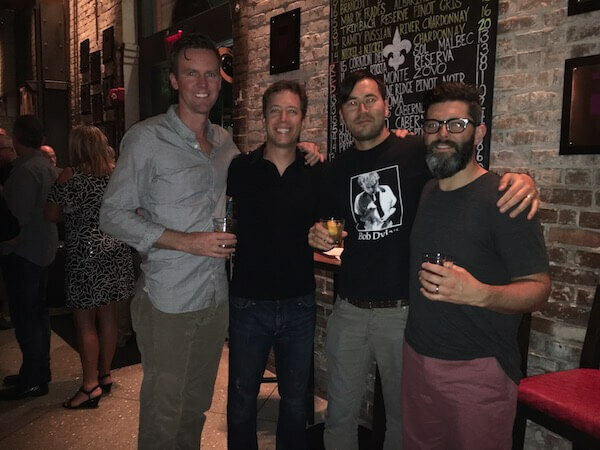 Last year, all of us (except one member whose wife prevented him) traveled to New Orleans for a long weekend of jazz clubs, food and whiskey, and though we had a minor hiccup of a level one hurricane, we weathered the storm and came out stronger. We went to New Orleans because we’d read two books located there: “The Moviegoer” by Walker Percy and John Kennedy’s Toole’s “A Confederacy of Dunces.” I can’t emphasize how even a short weekend trip binds a book club together. We’re still referencing jokes that happened that weekend – someone got “handsy” at night, the wonderful British women we met, the crazy street fiddler (New Thousand) with a sexual magnetism rivaled by none. If you want your book club to truly last, you have to create and deepen friendships, and do so deliberately. Travel is one of the best ways to do this. Four of our five members in New Orleans on our annual book club trip. Okay, this is not impossible. Sure, Jonathan Franzen won’t visit you, but if you choose a smaller book by a mid-list author, especially if they are local, there is an excellent chance they will drop in on your club. If they aren’t in the vicinity, then ask them to Skype in. Just be respectful of their time and make sure to prepare some thoughtful questions. If you have a book club, I’ve love to hear about it in the comments. Especially what type of books you read and how long you’ve been meeting. 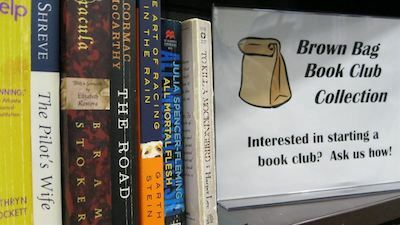 The Best Book Clubs Throughout History (I like the women’s literary club “Friends in Council”). The Millions has an excellent post talking about the social power of book clubs.